The cool kids may have migrated to NoSQL but, for many of us, relational databases remain an important part of everyday web development. I’m also willing to bet relational databases will still be around in ten years time. Despite our familiarity, SQL syntax is a dark art. The only person who understands SQL is that strange bloke with a beard and sandals who mutters to himself in the corner of your office. Everyone else uses the force and spends many frustrated hours looking aimlessly at broken SELECT queries. The command is simply added to the start of your query, e.g. Erm — what does that all mean? Click any bold underlined text for further information about the EXPLAIN result. 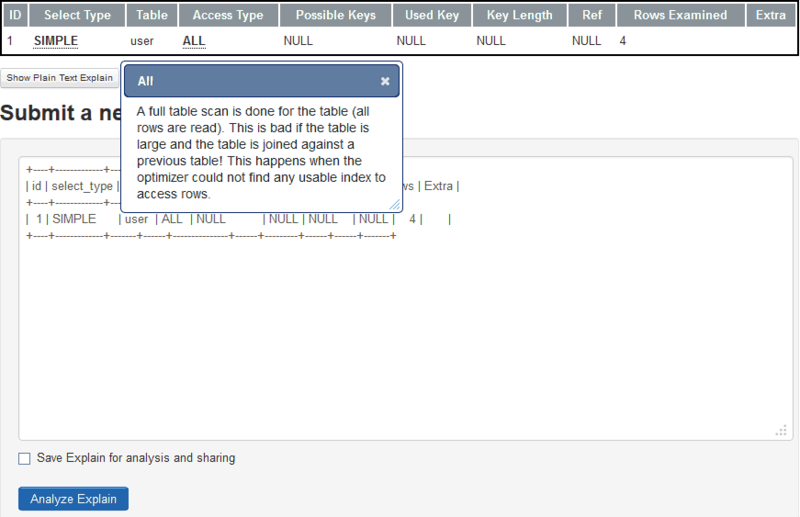 Copying directly from the console into the Analyzer won’t work unless you remove the necessary line breaks first. You may be able to increase the width of your console window but there’s no guarantee every result would fit. A better alternative is to output the result to a text file and copy the EXPLAIN table from there. If you’re using the MySQL command line, the tee command will redirect all console output to a named file, e.g. In this case, the output filename path should use your OS standard, i.e. ‘\’ on Windows and ‘/’ on Mac or Linux. The Explain Analyzer is a great tool which explains EXPLAIN in plain-English. You’ll soon become the SQL guru in your team … start growing that beard.